The 37th season of Seattle Seahawks football was a very special one for me and the rest of the 12th Man. From day one of training camp on July 27th to day 177 last Sunday, we were a part of a journey that had its ups and downs and showed us how far a group of men can come and improve in such a time span. Most importantly, this Seahawks team showed what is to come next year and for many seasons following. I attended 10 of our 16 regular season games this season; 8 home games from my 2nd home in section 340 at CenturyLink Field, and spent hundreds of dollars to make sure my voice was heard and body was present in Arizona and San Francisco. Instead of chronicling our season from start to finish in a traditional season review piece that many other people will do, I have compiled my top ten moments of the 2012 season. These moments are not only the moments I witnessed first-hand but also the moments that were the most exciting and the moments that contributed in how our season was shaped. Some will agree with my list, others will disagree. Maybe you agree on the moments but not the order I have placed them in. Nevertheless these are the moments I have chosen as worthy of our top ten of the 2012 season. Let the debate begin! 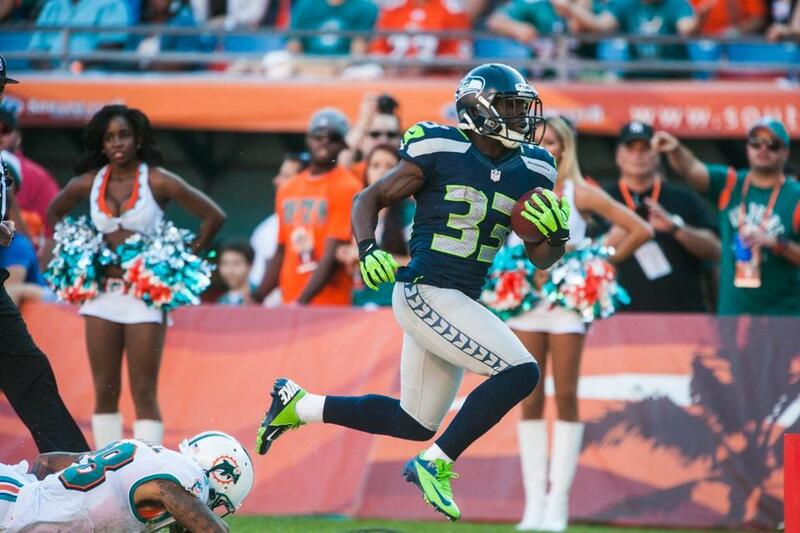 Leon Washington made history in the fourth quarter of the Seahawks loss to the Miami Dolphins in late November. After scoring a touchdown to tie the game at 14-14, Miami kicked off to Washington with 8 minutes left in the game. Washington took Dan Carpenter’s kickoff 98 yards and into the endzone for a touchdown that gave the Seahawks a 21-14 lead. The kickoff return touchdown was Washington’s 8th in his career and that number ties Cleveland Browns kick returner Josh Cribbs for first all-time in that category in NFL history. After coming back from a devastating leg injury three years ago, Washington has re-emerged as one of the most dangerous return men in the league. Although he is getting older I fully expect Washington to play a big role on special teams next year. He has a unique burst and you could tell he was close to breaking off a couple big runs in the playoffs. Hopefully next season Washington can claim sole possession of first place in kickoff return touchdowns. When you combine a national television primetime setting, a ferocious fan base, an extremely talented defense, and a sub-par offensive line, you get my number nine moment of the season. With the entire nation watching the Seahawks defense combined to sack Packers quarterback Aaron Rodgers 8 times in the first half alone. Chris Clemons led the attack with 4 sacks, rookie Bruce Irvin added 2 of his own, and defensive tackle Brandon Mebane also added 2 sacks. It was the most dominant span on defense this season and as I noted in my Packers review, it actually left me laughing in the stands because our play was so amazing and dominant. If only our pass rush could have been more consistently dominant over the course of the entire season. If that happened, we may still be playing football. I tipped my hat to the Seahawks defense on this night. I probably won’t see that many sacks recorded during a 30 minute span again in a very long time. The Seahawks debuted their wolf grey uniforms in Toronto against the Bills on December 16th and Russell Wilson looked especially good in them. The Seahawks were coming off a 58-0 win over the Arizona Cardinals the previous week and the offensive surge did not stall against the Bills. 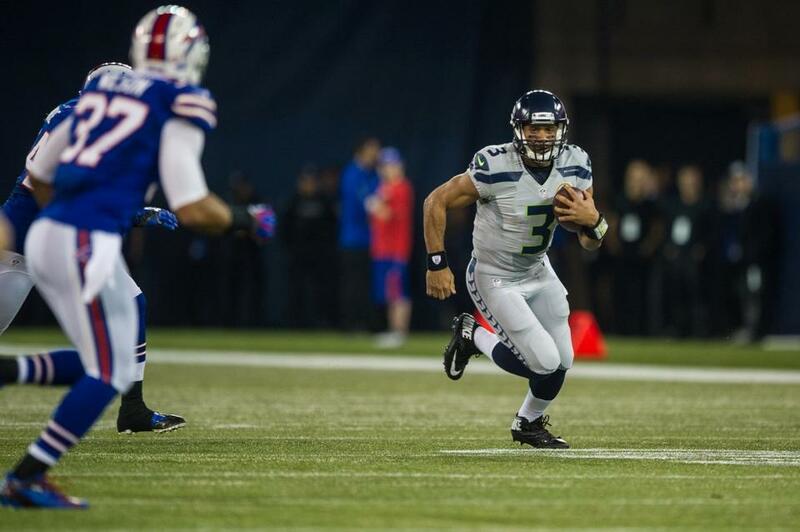 The Seahawks won the game 50-17 but Russell Wilson was the biggest factor in the final score. Wilson became the first quarterback in Seahawks history to run for three touchdowns in a game and he ran for all three in the first half. The zone-read option worked the best against the Bills in my opinion as Wilson and the running backs combined for 270 rushing yards. 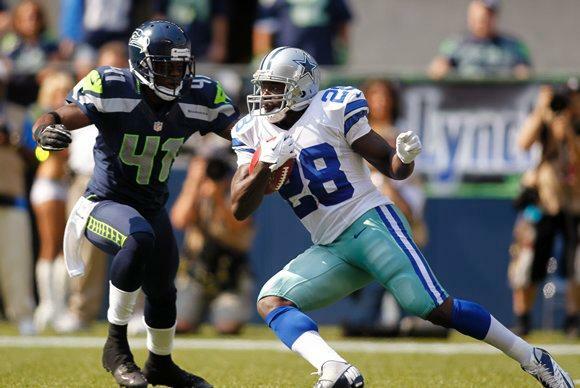 The Seahawks hosted the Dallas Cowboys in their home opener on September 16th and the game could not have gotten off to a worse start for the Cowboys. With the entire sellout crowd already in their seats for kickoff, the Seahawks kicked off to Felix Jones of the Cowboys to start the game. After making it out to around the Dallas 25-yard line, Jones was hit on his side which knocked the ball free from his arms. Earl Thomas recovered the fumble and the crowd erupted into chaos. Ten seconds into the game and the Cowboys had already turned the ball over, given the Seahawks excellent field position, and they gave the 12th Man something to go crazy about. In the stands the play was awesome and everyone around me was beyond excited. The drive culminated into just a field goal but luckily for the Seahawks and the fans, the Cowboys were not done with their special teams blunders yet. 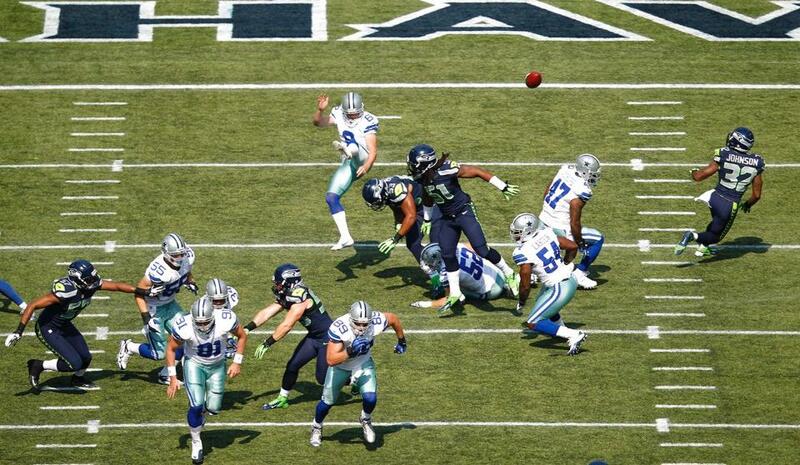 After this play my friend Alan and I believed that the Dallas Cowboys special teams unit was cursed in Seattle. With the Seahawks forcing the Cowboys to punt on their first offensive drive of the game, defensive end Bruce Irvin penetrated the punter protection and got one of his hands on the kick. The ball took one bounce backward and right into the hands of Jeron Johnson inside the Dallas 5-yard line. Johnson walked the blocked punt into the endzone for a touchdown and the Seahawks took a 10-0 lead early in the first quarter. This play was very fast since the block and score occurred within seconds of each other. Once again, the crowd went crazy and we now had full confidence that we could beat Dallas handedly on this day. Coming off a win in Carolina the week before, the Seahawks came home with a 3-2 record and a home date with the defending AFC champion New England Patriots. 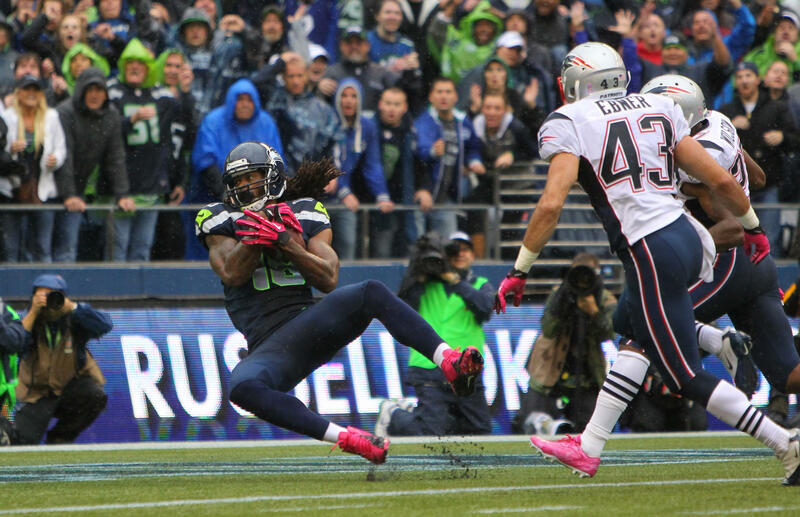 The Seahawks trailed the Patriots 23-10 with 9:21 left in the game. Russell Wilson connected with Braylon Edwards for a touchdown on 4th down to cut the Patriots lead to 6 points. 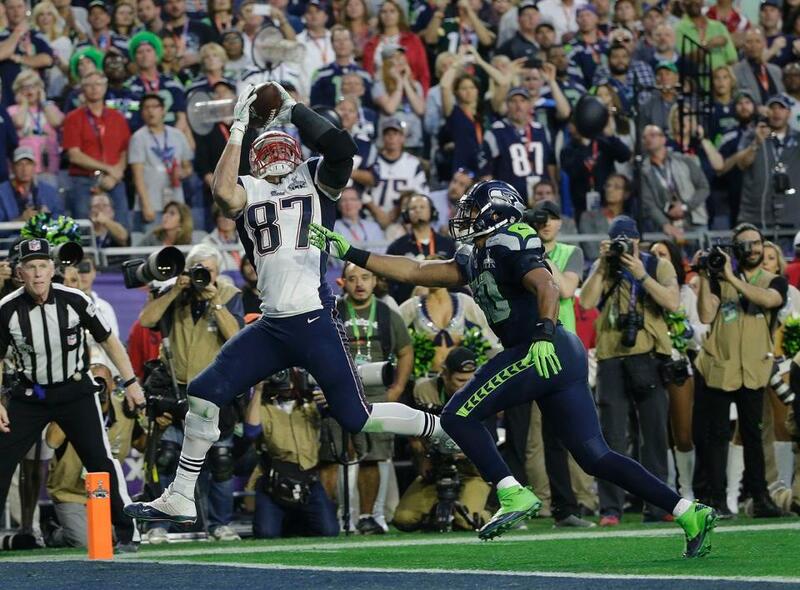 The Seahawks got the ball back with 2:38 left in the game with a chance to take the lead. With 1:10 left in the game, Russell Wilson connected with Sidney Rice for a 46 yard touchdown pass which gave the Seahawks a 24-23 lead. It was the prettiest pass I saw Wilson throw all season long. The Seahawks defense came back onto the field for one last New England drive and successfully stopped the Patriots on four plays, giving the Seahawks the win. One other storyline of this game was the communicating (or trash talking) between Patriots quarterback Tom Brady and Seahawks cornerback Richard Sherman. During the game Sherman challenged Brady to throw in his direction while Brady told Sherman to see him after the game when the Patriots win. Brady did in fact challenge Sherman by throwing in his direction and Sherman picked off a pass in the 3rd quarter. After the game Sherman went up to Brady to tell him “you’re just a man. We’re a team.” The exchange was photographed and was given the caption “U Mad Bro?” with Sherman mouthing off to Brady while Brady tried to walk off the field. 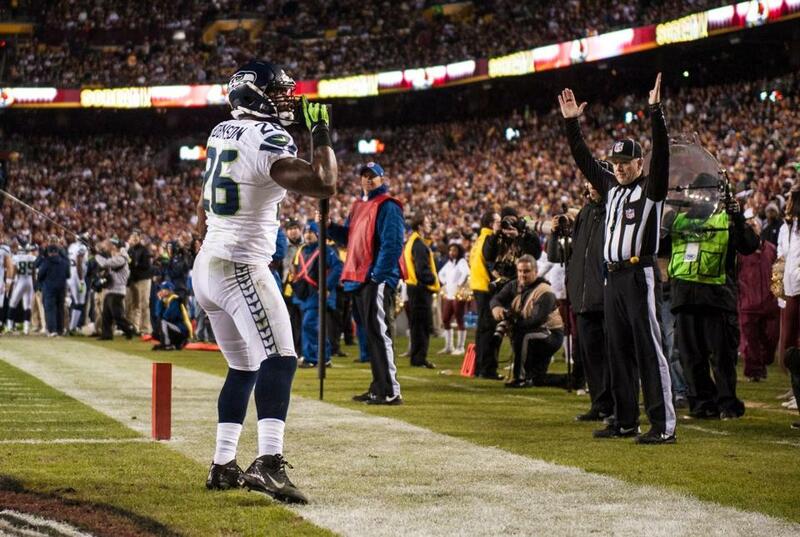 This moment tossed Sherman into the national spotlight. After this incident Seahawks fans started to love Sherman even more and fans of other teams started to loathe Sherman. The Seahawks finished ½ game behind San Francisco for the NFC West title but they still earned the #5 seed in the NFC playoffs. The Seahawks faced the NFC East champion Washington Redskins in the Wild-Card round of the playoffs and things did not get off to a good start. Washington jumped out to a 14-0 lead after the first quarter. At the time it was the largest deficit the Seahawks had faced all season long. The Seahawks came back thanks in large part to Russell Wilson, Marshawn Lynch, and Earl Thomas. The Seahawks scored 24 unanswered points in the final 45 minutes to beat the Redskins 24-14 to advance to the NFC Divisional playoffs. This game was the only playoff game to feature two rookie quarterbacks. Redskins quarterback Robert Griffin III was playing with a sprained LCL in his right knee and he was unable to finish the game after further damaging his knee. The Seahawks did a great job of containing Griffin III and their rookie running back Alfred Morris. It was one of the most exciting road games of the season and the Seahawks came back home not before winning on the road for the first time in the playoffs since Chuck Knox’s Seahawks beat the Miami Dolphins in an AFC Divisional playoff in 1983. 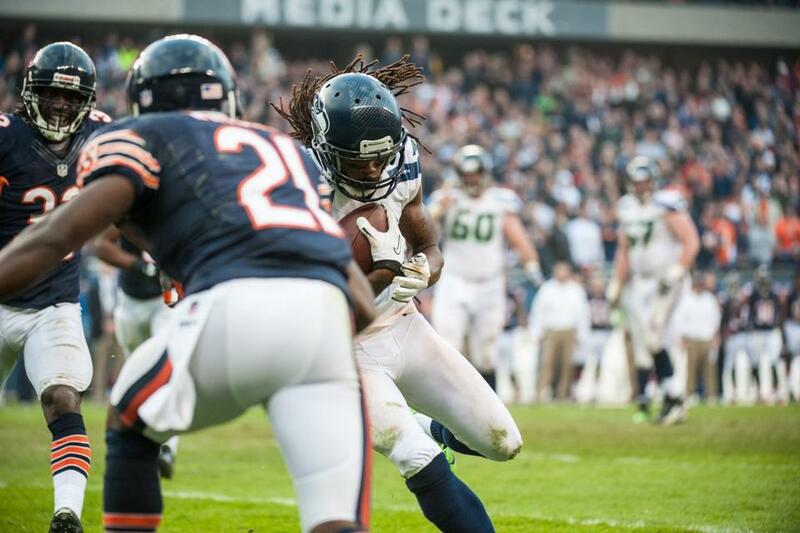 After losing to Miami in week 12 the Seahawks hit the road again for a crucial game against the Chicago Bears. 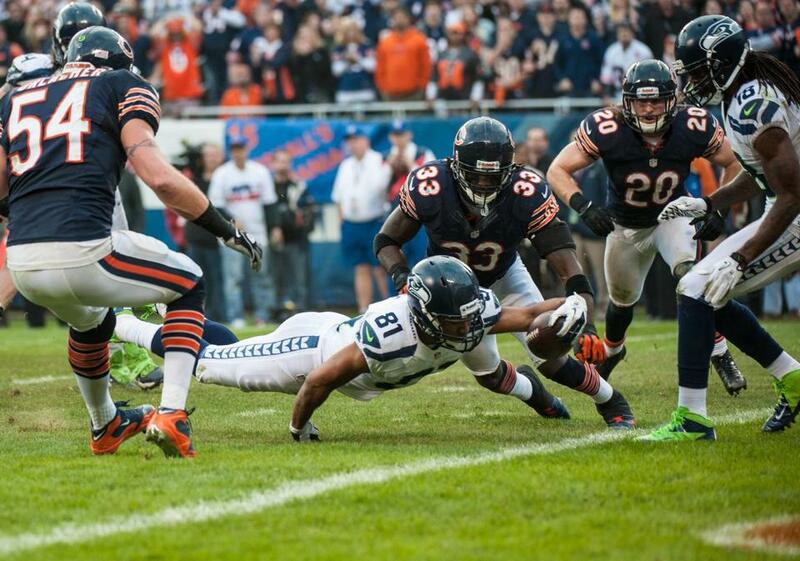 At the time the Bears held the NFC North lead while the Seahawks controlled their own destiny as an NFC Wild-Card. 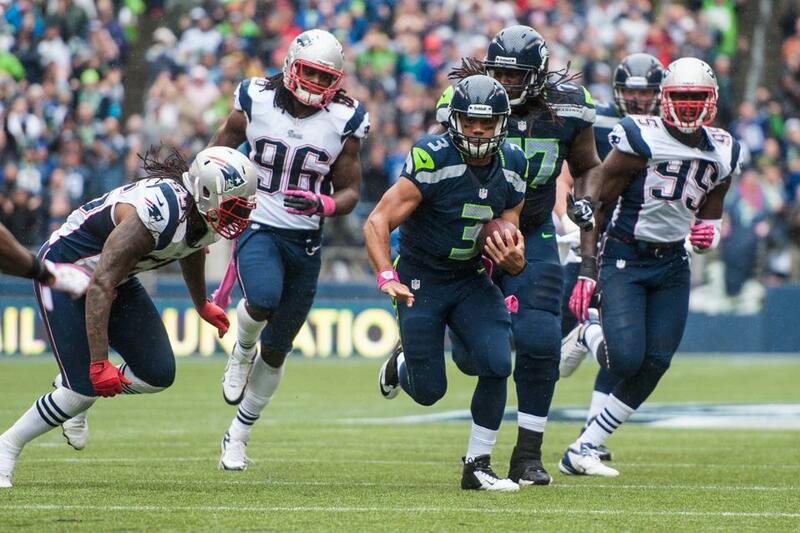 With the Seahawks trailing 14-10 with 3:40 left in the game the Seahawks had to drive 97 yards to take the lead. 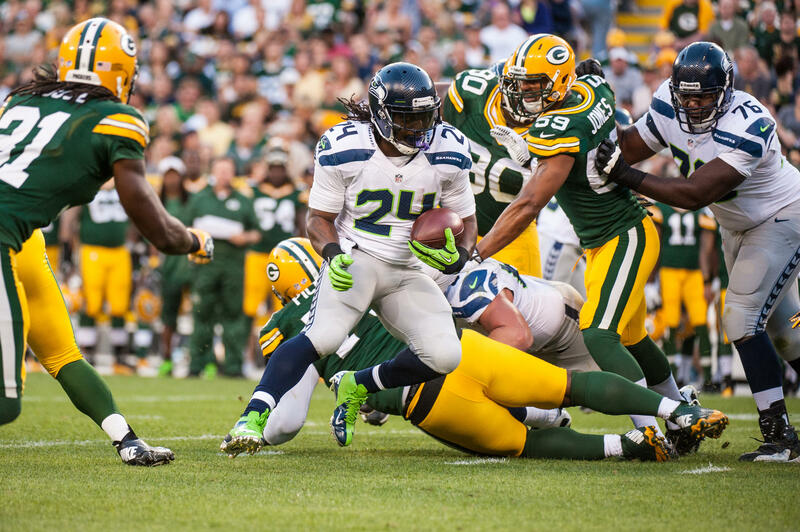 On the drive Marshawn Lynch racked up 21 yards and Russell Wilson also ran for 19 yards. Wilson hit Zach Miller to convert a 4th down which would have ended the game if the pass was incomplete, and then he found Sidney Rice for a gain 27 yards. With 24 seconds remaining Wilson hit Golden Tate on a slant. Tate juked two defenders before diving into the endzone for the go-ahead touchdown. The Seahawks took a 17-14 lead. Game over right? Unfortunately not. Because of a breakdown in communication on defense, Jay Cutler found Brandon Marshall for a gain of 56 yards to put Chicago in field goal range. Robbie Gould knocked the kick through the uprights and the game was headed to overtime. 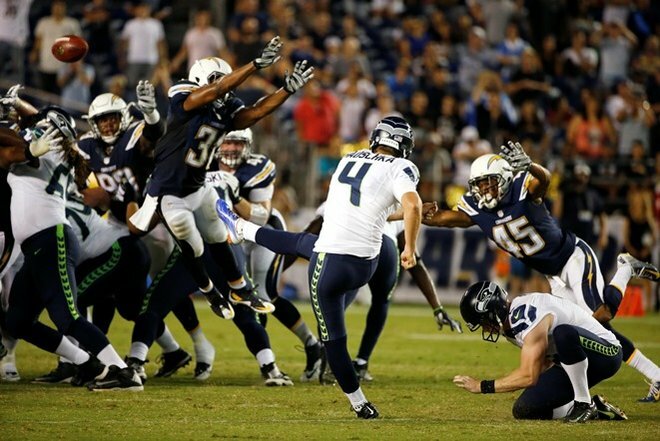 In overtime the Seahawks won the toss and started their next drive on their own 20-yard line. Did Wilson have another game-winning drive in him? He proved that he could go down and win the game again. Thanks in large part to Wilson’s legs, he led the Seahawks into the red zone and connected with Sidney Rice from 13 yards out for the game winning touchdown. This was just the Seahawks second road win of the season but with the win we improved to 7-5. These two drives are considered to be the turning point in our season. In our next three games after the Chicago game the Seahawks scored a combined 150 points. Most importantly though, the Chicago game was the start of an impressive winning streak that did not end until the Divisional playoff loss to Atlanta. I stepped into CenturyLink Field on Sunday Night December 23rd expecting to see a close, hard-fought game against the San Francisco 49ers. If we won we would clinch a playoff berth. I had no idea how bad of a mismatch and how big of a blowout this game would turn out to be. My number two moment of the season occurred with just over 12 minutes left in the second quarter. With the 49ers trailing 14-0, kicker David Akers lined up for a 21-yard field goal. 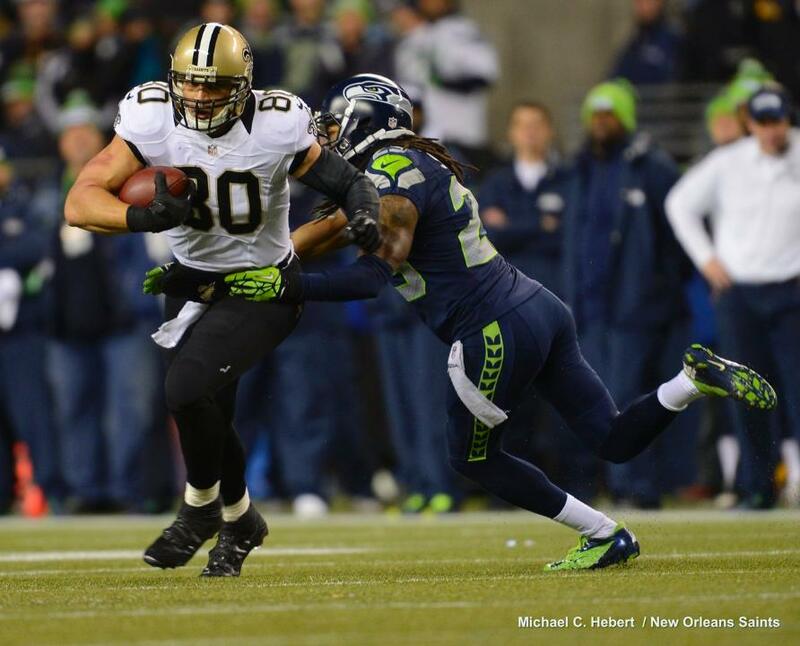 The kick was blocked by Red Bryant and the ball bounced right into the arms of Richard Sherman. 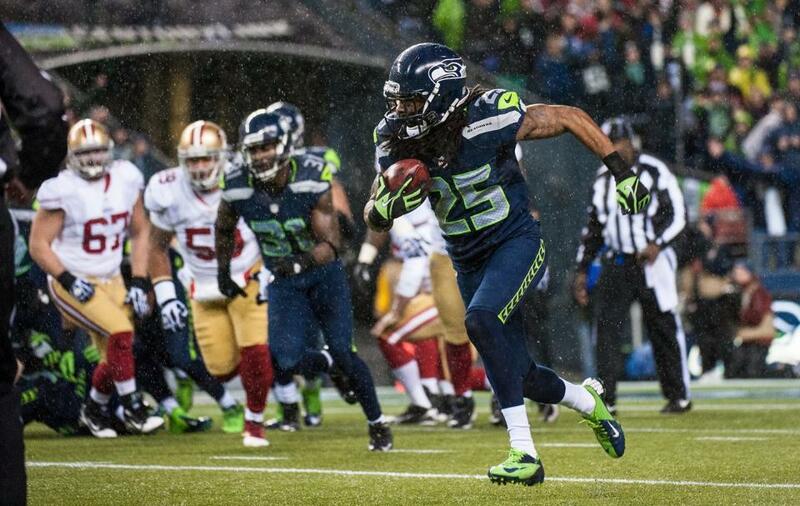 Sherman returned the ball 90 yards to the house for a touchdown and a 21-0 Seahawks lead. The game was over at this point. Everyone in the stands felt confident we would handle San Francisco for the rest of the night. In the stands the play was wild, which justifies my reasoning for ranking this play as the second best of the season. Once I saw the ball blocked and picked up by Sherman, I knew he had the speed and separation to outrun both Akers and the holder Andy Lee. I started jumping up and down wildly and screaming at the top of my lungs while pulling and shaking the guys who sit below me. Once Sherman crossed the goal line I ran down the stairs of my aisle collecting high fives and hugging everybody in my vicinity. I could not have been happier and the last time I celebrated that wildly on any play was the Marshawn Lynch beast quake run in the 2010 playoffs. I guess there’s something about primetime football that brings out the wild child in me. 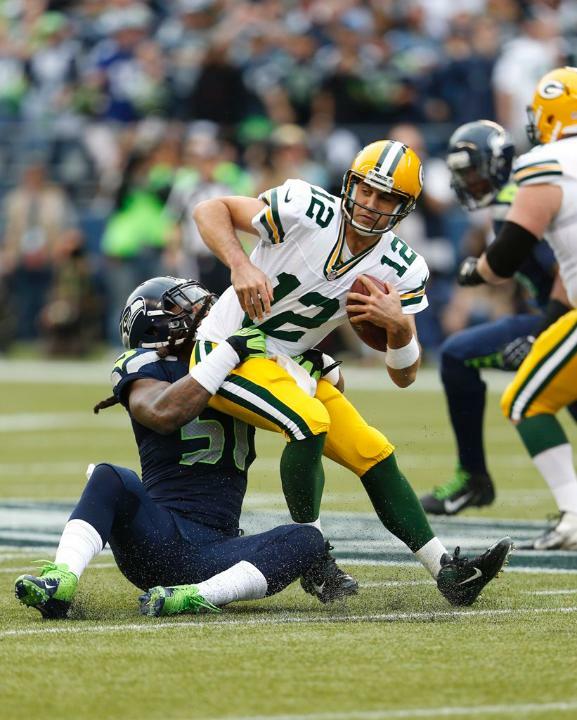 The Seahawks won the game 42-13 and clinched a playoff berth. Not only that, we also beat the hated 49ers which always puts a smile on my face. As the season wore on a lot of Seahawks fans got the feeling we were developing as the most hated team nationally during the 2012 season. The reason why is because of what transpired on Monday night September 24th. With the Seahawks trailing 12-7 with 8 seconds left, Russell Wilson threw up a Hail Mary into the north endzone. 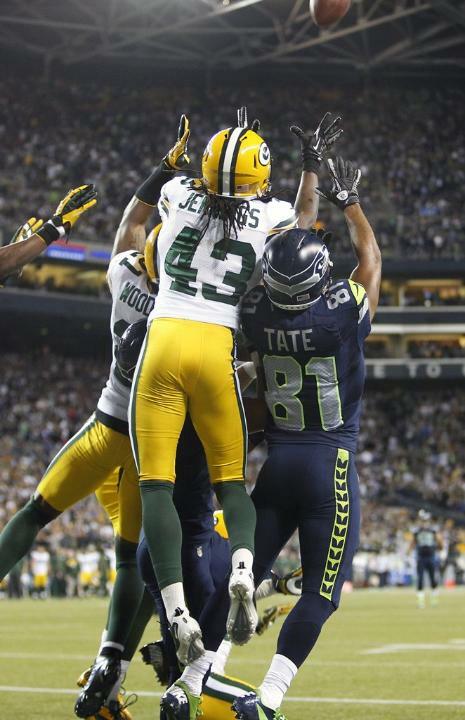 From my view it looked like Golden Tate out jumped three Green Bay defenders to make the catch. When one of the officials ruled touchdown, the stadium went absolutely crazy. Everyone around me started to jump up and down and we all embraced each other with looks of sheer amazement and non-belief in our faces. I had never seen a more epic finish then what had just happened. The play was reviewed by replacement official Wayne Elliott and the call on the field was upheld. 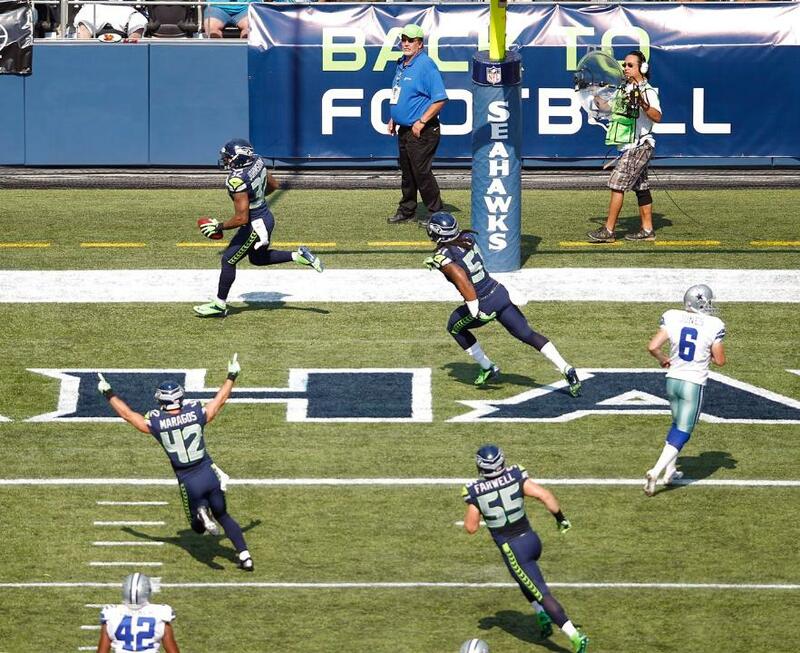 The Seahawks won in what ESPN’s Mike Tirico called “the most bizarre finish you’ll ever see.” In the stands we couldn’t believe what had just happened and we headed out of the stadium under the impression that Golden Tate had cleanly made one of the greatest plays we had ever seen. I had never attended a football game that was decided by a Hail Mary on the final play so the adrenaline was coursing through my veins. I collected a program after the game that was sitting on a picnic table because I wanted a piece of memorabilia from the most exciting game of the year. Nobody I was with had the slightest clue what had actually happened on the field. When my friends and I got home from the game we turned on SportsCenter and watched for two hours as they broke down the final play. As you well know, the play was not as clean as it looked like from my view inside the stadium. We won the game but the controversy over the replacement officials had just begun. The SportsCenter following this game was the most watched episode in ESPN history and within 48 hours of the game, the referee lockout was over and the real NFL referees were back on the field. Sports Illustrated named this play the most iconic sports moment of 2012 and it is definitely deserving of that title. I have a mini-shrine to this game in my room including my ticket stub, the program I picked up, the rally towel that was given away at the game, and the front page of the Seattle Times sports section from the day after with the headline “Last Call?” Although I will be attending many many more football games in my lifetime, I am confident in saying I will never see a more incredible finish then what happened on this crisp September night.